Hostem was founded by the hardest working man in show business (James Brown! 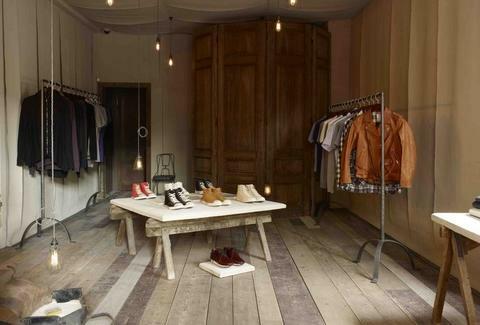 ), who after having lived in locales as far-flung as LA and Umbria, decided to bring his favourite menswear back to London in a rustic-style, dusty-look shop, outfitted with crooked wooden floorboards, rusted-brass clothes rails, a chandelier festooned with mini-lampshades, and low-hung cages holding something called a "US trouble light" (so, half the calories, same great Afghanistan taste). The first of the three rooms showcases fashion-forward but wearable casual gear, like Japan's clean and simply lined Visvim shoes, the understated, muted Danish knitwear of SNS Herning, and all-cashmere jumpers, tees, and hats from LA's Elder Statesman, which Hugh Hefner appreciates because he likes his clothes the way he likes his food (soft). Edgier stuff bedecks room two, such as innovatively minimalist Italian brand MA+, the London-based, old-school-tailoring-meets-modern-sportswear of Casely-Hayford, and Ann Demeulemeester's nouveau-gothic clothing, which earned her inclusion in cutting-edge fashion cadre "The Antwerp Six" -- who fashion police claim are responsible for an avante-garde explosion (but who probably just sit around playing cards). The ever-evolving third room will host a single designer at a time, with debut duds coming from "Dr. Romanelli's Prescription Shoppe": a mad schemer and collaborator famous for customizing everything from reconstructed Levi's bombers, to Converse shoes covered in plasters, so your feet will look like Jose Mourinho Avram Grant Felipe Scolari Guus Hiddink Carlos Ancelotti feels.